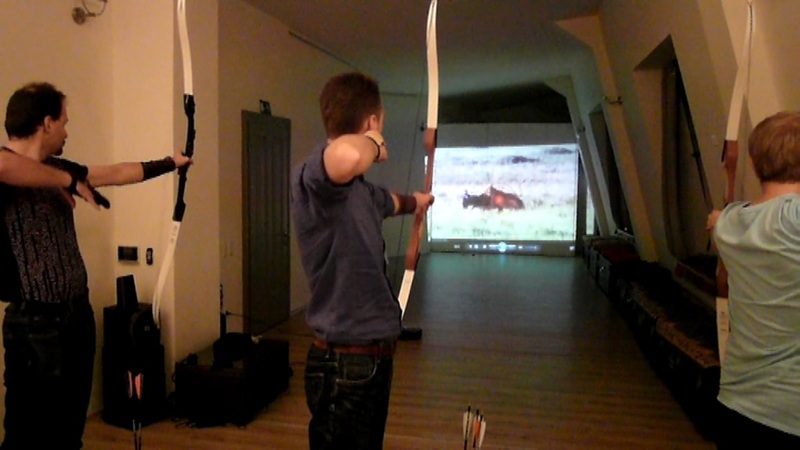 What can be better than a combination of archery and cinema? It is a well known issue to every archer living in a city: Time is short and it takes forever to drive to the next parcours. But, as an old proverb says: Necessity begets ingenuity. We have created the first archery cinema in Europe. Some lateral thinking and tons of endurance led to an ingenious yet simple result: The packaging foam Ethafoam proved more than once that it is highly suitable for any kind of usage as a backstop. 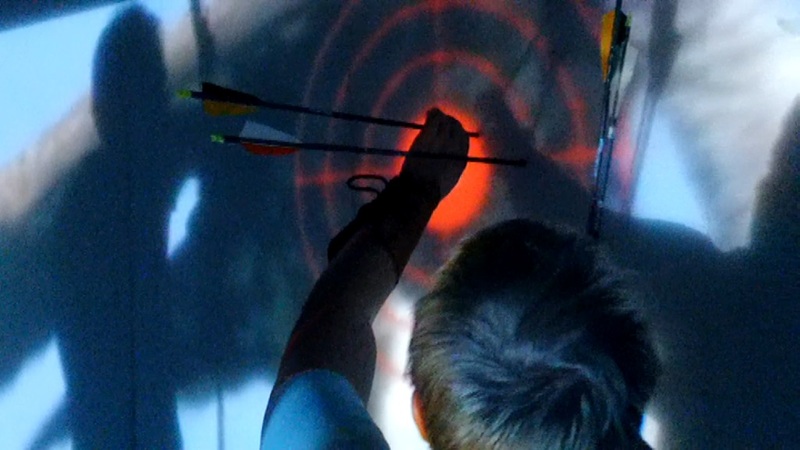 Even thin layers are easily capable of stopping an arrow shot from a 50 lbs bow, which makes them perfect for our project. We built segments of 2.7 meters height and 60 centimeters width. Following a simple plug-in principle we obtained a white wall of an overall projection surface of 3.60 by 2.70 meters. A powerful projector ensures a clear image and a few specially edited safari movies provide the targets. Imagine you are watching a wildlife documentary, only without David Attenborough’s soothing voice… and this time you can participate! The animals run on the screen in high definition, and then the scene suddenly freezes for a few moments. A bull’s eye target shows you where to aim. You need to shoot quickly, as the movie will resume after several seconds, leaving the archers eager to take the next one. Every five shots, the archers have the opportunity to retrieve their arrows. The last five frames will be displayed again, so that the archers can celebrate their success or realize how distracted they were by the “hunting fever”. A typical video has between 20 and 30 scenes. The scene succession ensures an adrenalin-packed experience. 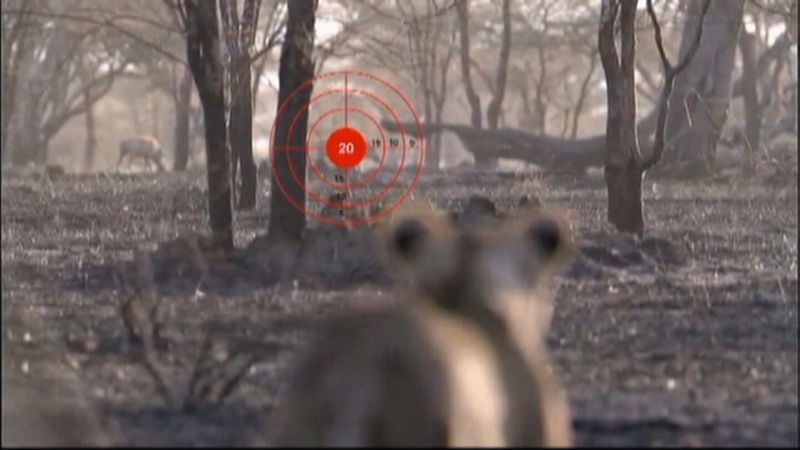 There will be the possibility to shoot alternately at lions, gazelles, wildebeests, hedgehogs and more. It is a thrilling experience to see a crocodile pulling a wildebeest in the water or a lion chasing a gazelle, approaching with huge leaps, freezing in the frame the instant before it reaches its prey. Another critial factor for this kind of movie is the right background music. Accompanied by the roaring of a lion, the deafening stomping of gazelle and wildebeest herds, the malicious laughter of hyenas and the rhythmic sound of drums will make you feel the savannah close up. Since there are thirty targets in about forty minutes, the safari offers a thrilling and intense experience to everyone. You think a safari like that sounds kind of dull? You yearn for something more exciting than the familiar animals of nature? Well look no further. After hours of intense gaming and video editing, you can now be the Dragonborn. Stop a charging bear in its tracks. Save the realm from the roaming monsters. Test your nerve against the fiery breath of a dragon. Twenty beasts await you. No matter whether in a penthouse right over Vienna’s roofs, in a cellar or a hall, the archery cinema will not take more than ten minutes to set up and to dismantle it again as Ethafoam, apart from being highly functional, is very lightweight. The segments need to be set up, the projector positioned in eight to ten meters distance and the loudspeakers connected and you are ready to go. Naturally time has to be invested to firstly build what is needed and secondly in perfect movies as only high definition scenes and the right selection of scenes will lead to a higher pulse. The first movie cost forty hours of hard work until all scenes were edited and the sound synchronized but the result is simply stunning! And when there is no movie to be shown the segments offer great stopping power for shooting games which otherwise would be too risky. Fun when shooting, some adrenalin and a hint of hunting-flair without a long drive and loss of time. Obviously there is another big advantage: complete independence from weather and other natural circumstances! To that end, the Arco-Vienna Club wishes “Good luck and all in the kill” to all archers out there!